A 16-year-old girl was attacked at her school by two intruders who made their way on to the premises. 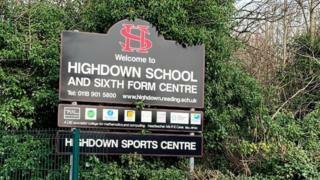 They targeted the girl at Highdown School, Reading, on Monday and showed "very threatening behaviour", the head teacher said. Parents said there were rumours of knives, but the school said no weapons were seen. Police said the victim did not sustain serious injuries, and no arrests had been made. Head teacher Rachel Cave said the attackers were let in by other students and were "seeking out a specific individual". She said the two were not part of the Highdown community, and they left the site immediately. A letter sent to parents said the school was working with authorities to investigate. It said it would not be releasing further details in order to "respect the students most closely involved". It added: "On conclusion of all investigations there will be a thorough review of all processes."